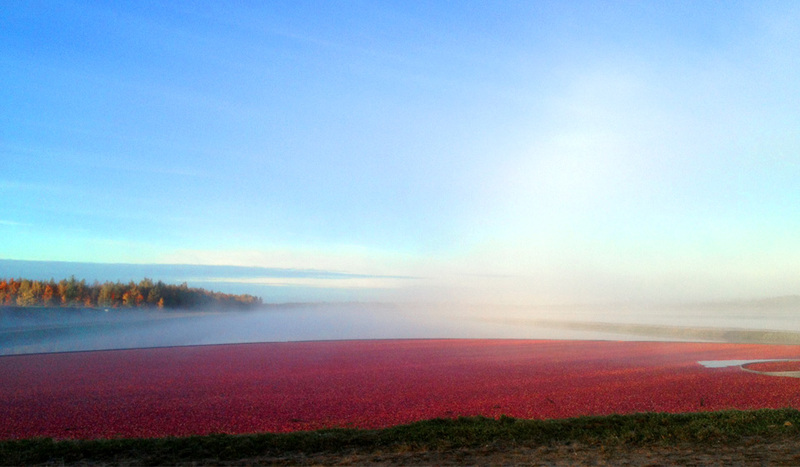 Some would say that a cranberry harvest is the most beautiful of all harvests to experience. Imagine a sea of red fruit floating on the calm picturesque waters of a flooded bog, as the light of dawn rises on a clear morning. This is truly an awe-inspiring and rare experience in agriculture! Our annual harvest typically takes place from the end of September through to the beginning of November. To harvest cranberries, the bogs are initially flooded to a couple of inches above the vines and a harvester will mechanically separate the berries from the vines. Once separated from their vines, the cranberries rise to the top of the water due to four separate air chambers found within the berry. The fruit is then corralled into a corner of the bog to be conveyed or pumped into the delivery trucks. Every year, we harvest approximately 20 million pounds of cranberries making up almost nine billion cranberries!